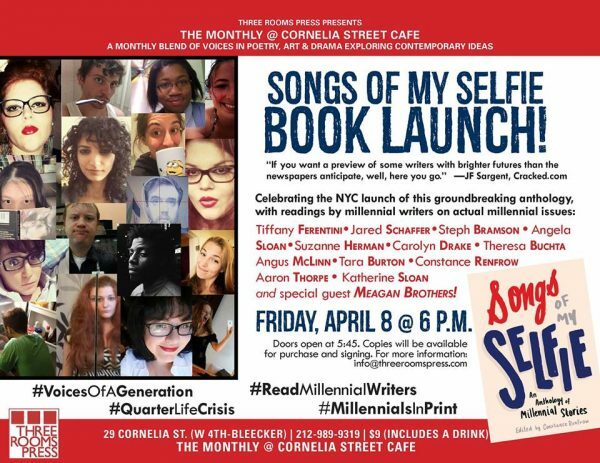 Three Rooms Press celebrates the New York launch of SONGS OF MY SELFIE: An Anthology of Millennial Stories—for millennials, by millennials, about actual millennial issues—on Friday, April 8, 6pm at Cornelia Street Cafe. The launch will feature readings from SONGS OF MY SELFIE, including contributors Suzanne Herman, Stephanie Bramson, Tiffany Ferentini, Aaron Thorpe, Theresa Buchta, Jared Shaffer, Angela Sloan, Tara Isabella Burton, Carolyn Drake, Angus McLinn, Katherine Sloan, and editor/contributor Constance Renfrow. Plus, a special guest reading by IndieFab finalist Meagan Brothers, author of WEIRD GIRL AND WHAT’S HIS NAME. In addition, the event will offer free giveaways, millennial swag, great music, and more! Copies of SONGS OF MY SELFIE will be available for purchase and signing. Doors open at 5:45. Admission is $9, which includes a free drink. Cornelia Street Cafe is at 29 Cornelia Street, in the West Village, between W. 4th Street and Bleecker (http://corneliastreecafe.com/). Friday, April 8, 2016, 6 p.m.
With fresh new voices and edgy prose, seventeen stories by millennial writers offer a cross-section of vibrant young characters: unemployed grads deep in debt, expectant mothers on the cusp of adulthood, online relationship addicts, and twenty-somethings at war with their families’ expectations. Here are the strong and the weak, the self-aware and those who reject reality—all carefully crafted to buck the common perception of this generation. THE MONTHLY series at Cornelia Street Cafe, hosted by Three Rooms Press, brings together writers, artists, philosophers, and scientists to delve into a different theme each month from divergent perspectives. Past themes have included conspiracy theories (on the 50th anniversary of JFK’s assassination), Code Poetry, an exploration of poetry that simultaneously works on multiple levels and languages, and notable literary figures including Charles Bukowski and William Burroughs.